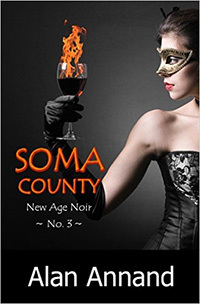 "Soma County" is, in my opinion, the best writing that Mr. Annand has done in his New Age Noir series. It flows, it is exciting (but not TOO exciting), it's mysterious (a good quality for a murder mystery). But the best thing is that it is chock full of Vedic knowledge. Among the areas it covers are natal Jyotish (Vedic astrology), a lot of Prasna (horary astrology), palmistry, numerology, nimitta (omenology), Ayurveda, Vastu (ancient Vedic rules of architecture), the interpretation of names, Tantra, and some Indian Martial arts. I loved this book so much, I almost don't know what to say. This volume is the 3rd in the series featuring detective/astrologer Axel Crowe. Who should read this book (and "Scorpio Rising" and "Felonious Monk")? Anyone who has any interest in astrology, Vedic or Western, MUST read these 3 books. They are a wonderful, fun to read textbook of Vedic knowledge with the greatest emphasis on Jyotish. They are classics. They are priceless gems. They WILL expand your philosophical/astrological horizons more than you could ever imagine. Also, as a lover of murder mysteries (I have read at least 500 of them), those who love the genre but are looking for a new angle, a new Asian/North American fusion taste should gobble these up without delay. I cannot praise "Soma County" or Alan Annand enough to do them justice. Take a chance. Live a little. Read it (and its' 2 predecessors) and you will be richly rewarded in ways that you probably cannot even imagine.